This dish looks and sounds unappetising, but I can assure you it’s delicious. It comes from Leith’s Vegetarian Bible which is a good book and especially recommended if you get an organic vegetable box. 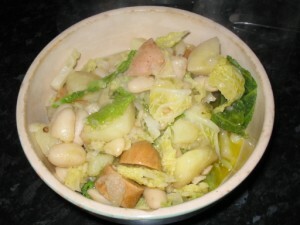 It’s a basic stew made from cannellini beans, potatoes, onions, savoy cabbage and chilli. The Portuguese original version includes spicy sausage, so I also throw in some Redwood merguez sausages too. I just drizzle the final product with some good olive oil.